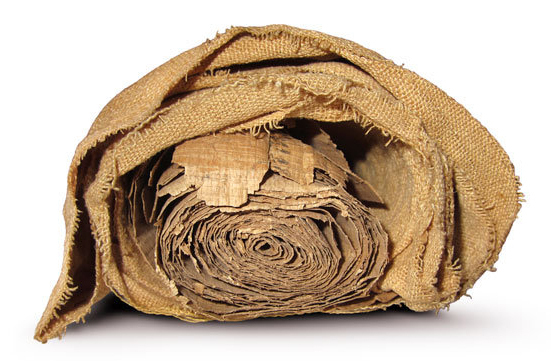 Linen bundle in which was wrapped an unknown, yet unrolled papyrus scroll. In 2013, the animal mummies in the Ancient Egyptian and Near-Eastern Collection were moved to a new depot, among them so-called ibis terracotta cones – oblong terracotta containers that functioned as sarcophagi for the mummies of ibises. Prior to their move the artefacts were carefully studied and cleaned, and this led to an unexpected discovery: one of the terracotta cones contained not only the expected ibis mummy but also a linen bundle in which was wrapped an unknown, yet unrolled papyrus scroll. Following comprehensive preparatory work and tests, the papyrus was carefully unrolled in early 2014. The fully extended scroll is 250 centimetres long and contains writing on both sides. References to dates in the text allow us to date it to the Late New Kingdom (c. 1100 BC), and the text also mentions the scribe’s name. The ibis mummy’s terracotta cone in which the papyrus was found is about seven centuries younger than the scroll, which begs the questions why and when the papyrus was placed in the vessel. Did this already happen in antiquity? Or only much later, when the terracotta cone travelled from Egypt to Vienna via Trieste in the nineteenth century? The exhibition explores these and many other fascinating questions connected to this amazing recent find.